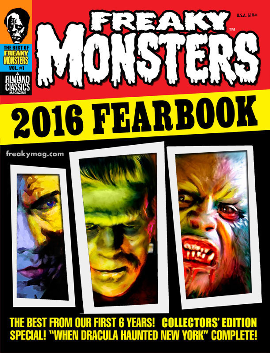 FREAKY MONSTERS 2016 FEARBOOK: THE BEST OF FREAKY MONSTERS SPECIAL COLLECTORS' ISSUE! "WHEN DRACULA HAUNTED NEW YORK" Complete! All 3 parts in one! FRANKENSTEIN, WOLF MAN, THE MUMMY, THE HUNCHBACK and more! Your favorite fiends! Rarest photos ever published! Fangtastic fotos!